Comments: Not sure, but if I had to guess, I'd say this picture was taken at Bob's Auto Repair shop on Whitehead Ave., in South River, NJ. The photo really represents the tail end of a time from when most gas stations not only sold gas, but also did car repair... And many shops that did car repair also had some kind of a racecar stuffed away somewhere inside the shop. It was as if the shop was making a statement that they were really good at what they did, and having a shop racecar kinda proved their expertise. Anyway, thanks for providing the photo Cos, because it does remind me of a time when the sport was filled with automotive and truck repair people who used knowledge and fabrication skills to build next week's feature winner! 12.24.09 Charlie Miller And if your shop had gas pumps , there was always the drunk that would pull in at 1 am on his way home who wanted you to open up so he could get a dollars worth of gas, while your trying to fix last nights fiasco. I'm trying to figure out if this photo was from the repair shop on Whitehead Ave. and if so, would that be the office area (through the door under the clock?). I remember Bob's shop had a few bays out front and then another repair area in the back... Kinda remember it was right near the railroad tracks too. 12.26.09 Mike Kent Looks like that could have been a former Rossell or Hearne racer at one time. My guess is that maybe they were all built by Bob Rossell, but that maybe we're talking about 2 or 3 different cars??? Bob was known for building a car and the racing it with the understanding that anything he built and drove was always for sale! He'd go out and win with it one of his creations, and the next thing you know, somebody else bought it, painted it and drove it! 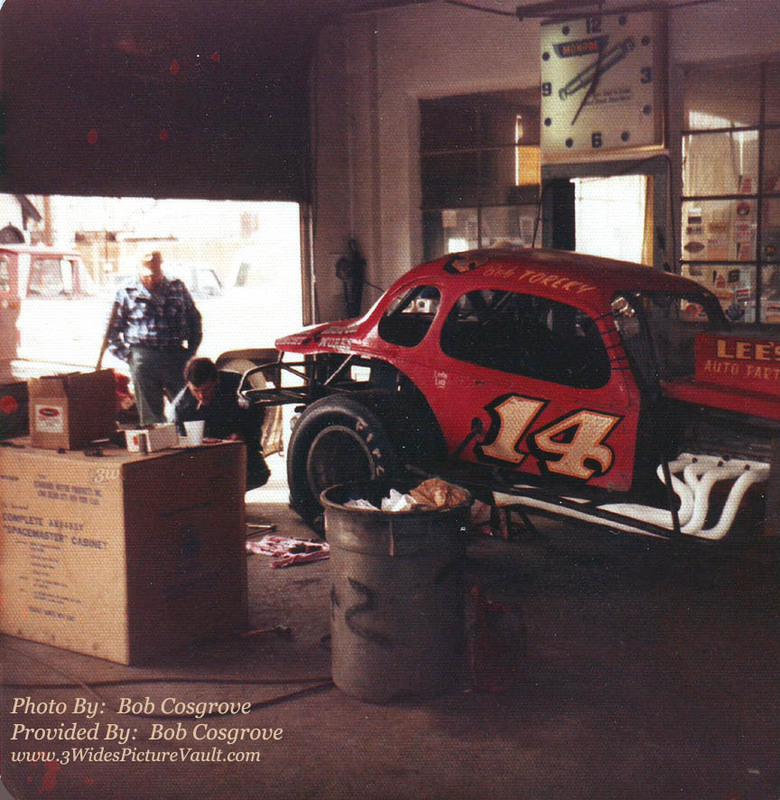 12.26.09 Cos CAR WAS A ROSSELL CAR...PHOTO WAS BEFORE GARAGE HAD REAR BAY...WAS ON WHITEHEAD AVE IN SO RIVER ...GUY W/ CIGARETTE IS TOM NOONAN " NO PROBLEM "
01.01.10 Joe Hauser Sr. Tom Noonan was with our race team for the years that we ran East Windsor, great guy ! , Always had "the answer" and a cup of coffee in hand. The first late model race Iever ran, I went down to this garage on Whitehead and picked up a couple of used firestones. Good people , Everyone associated with the 14 of Toreky. That's the way a modified should look like. Perfection.